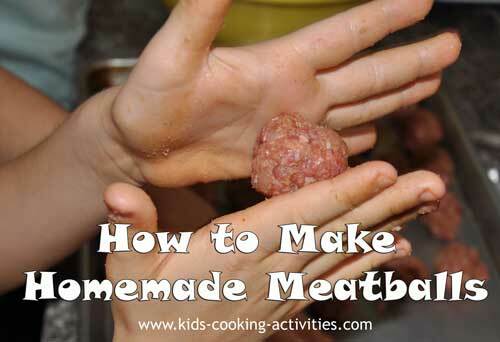 Learn how to make meatballs and don't forget to freeze extra for the freezer. Mix together the egg, bread crumbs, onion, salt and pepper in a separate bowl. Add the ground beef and mix with your hands until well combined. 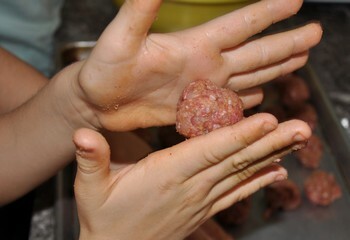 To make meatballs, take a piece of hamburger mixture the size of a golf ball or smaller. Roll between hands forming into a uniform ball. To cook meatballs, place in a skillet until browned on each side. Continue to cook until no longer pink. Or cook in a 13 x 9 or cookie sheet in the oven. Meatballs can also be cooked in the crock pot. You can add whatever seasoning or spices you like to the meatballs. Combine all ingredients together and shape into meatballs. Flash freeze on cookie sheet then add to a Ziploc bag. When ready to bake, cook at 350 degrees until done about 30 minutes depending on size. Serve with cooked noodles or with a fresh vegetable on the side. For a quick way to make mini meatballs. Make your favorite or the basic meatloaf recipe above, roll into balls and place in mini muffin tins or regular size works for larger meatballs. Cook for 13-20 minutes, depending on the size, or until done. Flash freeze and place in freezer bag. When ready to eat warm up in oven or microwave in a safe dish. all work great in meatballs. If you're not sure how much to add start small 1/4 cup to 1 lb. of ground meat. 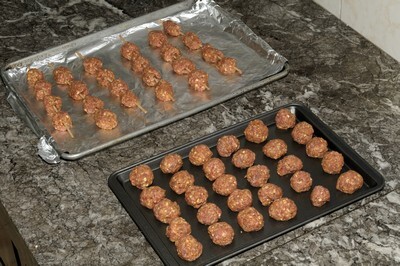 Meatballs also freeze well so make a large batch to have on hand in the freezer. 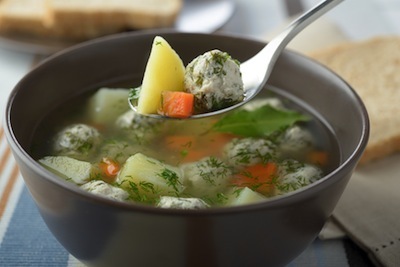 Soups, try this meatball soup recipe. Place in a crock pot or cook in a skillet with a homemade sauce such as a sweet and sour sauce, barbecue sauce or tomato sauce. Preheat oven to 350 degrees. In a mixing bowl, combine beef, bread crumbs or crackers, garlic, egg, soy sauce, and pepper. Mix together thoroughly. Use a small ice cream style scoop with a scraper button; like the one sold by Pampered Chef; to make perfect meatballs. 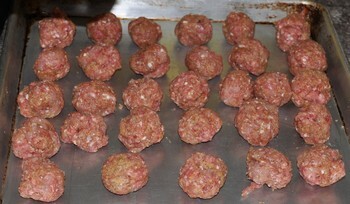 Place single layer of meatballs into a pan and bake at 350 degrees until cooked through, about 20 minutes. Remove from pan and place on a double layer of paper towels to drain. In a large, deep skillet or sauce pan with a lid, combine the canned tomatoes, fresh tomatoes, and spaghetti sauce. Allow the tomatoes to cook down, then add the spinach. Add cooked meatballs and simmer on low heat until spinach is wilted and tomatoes are tender. 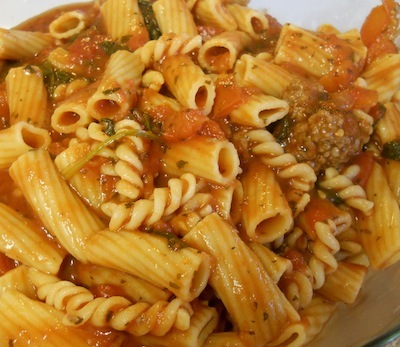 Place cooked, drained pasta into the sauce and stir to coat. Serve with a small amount of fresh grated Parmesan on top. Combine ground meat, egg, bread crumbs and parsley in bowl. Mix together and form into small meatballs. Set aside in the fridge while preparing the rest of this cold weather recipe. In saucepan add broth and carrots. Bring to a boil and add meatballs. Cook 5 minutes. Add ravioli. Simmer until raviolis are cooked. Make sure meatballs are done by cutting one in half or using a meat thermometer. Serve soup sprinkled with Parmesan cheese.